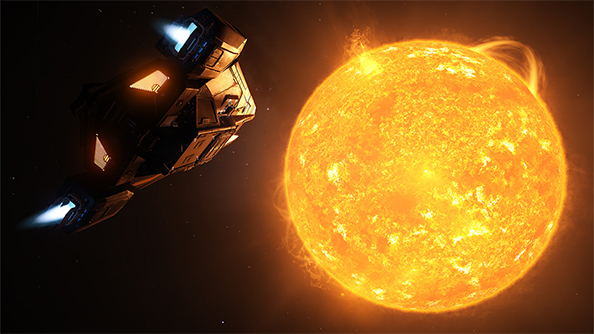 Last week Elite: Dangerous reached a milestone update, boosting the number of star systems by about a factor of ten, introducing new weapons, stations and planetary rings made of massive chunks of floating ice. With the ever expanding galaxy map comes the option to explore and scan distant frontier worlds for profit, with mapmakers now racing across the sky to be the first to log their findings with the board of stellar cartography. It’s all terribly exciting. I sat down with David Braben to discuss how Beta 2 is unfolding, what all this extra space means for players, when we can expect to start landing on planets and astronomy in general. Lovely, lovely astronomy. You can read our conversation below. And here’s why Elite matters. PCGamesN: So Beta 2 took the number of visitable systems from 55 to over 500, how soon until all 400 billion systems are opening up? David Braben: At some point we’ll pull a switch and that’ll be the whole lot opened up. But yes, Beta 2 added an extra 500 or so systems. DB: It’s to do with the shape of the area we’re expanding into. So we’re extending it from a sphere of systems to a sort of lozenge that expands towards unexplored space, because we want to slice through space but we don’t yet want to get into many of the central systems. There’s a lot more to come on those systems that we haven’t really done yet, the obvious one being Earth. PCGN: How will Earth be represented? Our solar system is rather big right, with lots of planets and moons? DB: No, it’s actually middling to smaller in many ways. We’ve got some complex systems in the game with three, four, five, even six stars, that are way more complex than our solar system. Each star can have several bodies and those bodies can have moons. In quite a lot of the cases even the moons have moons. 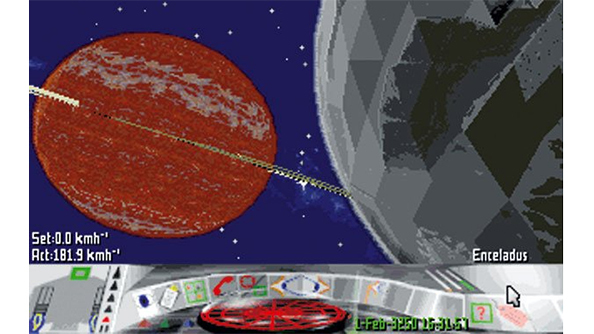 That was the case in Frontier: Elite II, you’d have very large systems like Achenar, the centre of the Empire, where you actually had three habitable worlds orbiting a single gas giant. From memory, at least one of those had a moon and orbiting stations. That’s much more complicated than the solar system. I wouldn’t even say our solar system is typical. It’s a very stable system and has been for a long time, that’s the unusual thing about it. I think humanity is very lucky — although luck isn’t the right word, we wouldn’t be here if it hadn’t happened — that we’ve had such a long and stable period of no close encounters with other stars to massively disrupt the system. 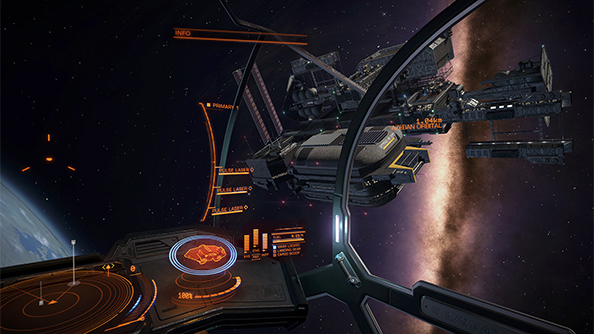 I’m fascinated by trying to make Elite: Dangerous as real as possible, but it’s also interesting from an exploration point of view. 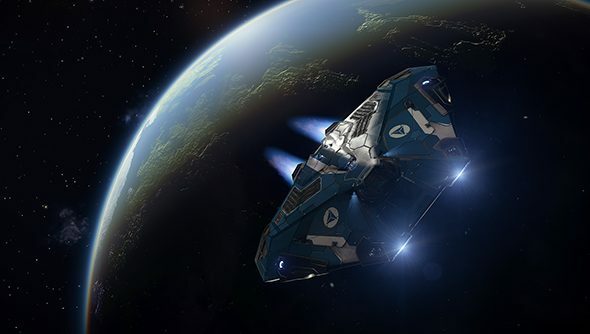 I want players to be able to use real world data to guess where in Elite: Dangeous there might be metals they can go and mine. Or where there’s likely to be an Earth-like world. PCGN: So how many of the local systems are accurate? DB: Every single star that’s in our night sky is in the game. That includes all the stars that are visible to the naked eye, which is around 6,000 or 7,000, but also the 160,000 or so stars that are only visible with telescopes. We also have stars that we can see with things like Hubble that we don’t necessarily have accurate positions for, but we know roughly where they’re grouped, so we’ve mapped our stars to match those densities. PCGN: Was it difficult to plug all of that real world data into your procedural engine? Where do you stop using real maps and start guessing? DB: Well everything comes with its own challenges, but we tried to make it as accurate as possible. One of the interesting things with the real world data we’ve used is that we’ve had to add a lot of dust. A lot more dust than is accounted for in reality, just to make the night sky in Elite: Dangerous look correct. Our night sky isn’t drawn by an artist. It comes from raw data, which is great but comes with a lot of problems. So because the first night sky we had looked very uniform and bright, we needed to add dust to try and make it look like the real sky. But that’s science! That’s science in the raw, because we have strong empirical evidence for this dust being there. Our sky needs to match the night sky, so adding dust like that is justified until it roughly matches. PCGN: With exploration having just been introduced, are you worried that players will very quickly map the entire playable area of the galaxy? DB: I think it will happen quite quickly in the sense that people will map it, yes, but remember that each person will start with some systems not mapped yet. So even when somebody comes back from an unexplored region and registers their exploration data it doesn’t automatically update for other players. Explorers sell that data and later players will be able to buy that map from vendors. So actually each person will always have that joy of exploration themselves. But it’s important to understand that just visiting a system doesn’t make it explored. I remember speaking to an American who told me “oh yeah, I did Venice in an hour,” and thinking well, no you didn’t! You might have visited it, or whatever “doing” means — it sounds like a bank job — but you certainly didn’t explore it. Once I was camping near the Grand Canyon and I remember these tour buses would roll up and stop for an hour. These people would get out, have a cup of tea, take some photos near the edge and drive off again. That’s not exploration. PCGN: Yeah, they didn’t scan any rocks. DB: My point is that the systems are big and complex and you have to go to each body to properly see and explore it. I want people to feel like explorers, not that they’re just ticking boxes. PCGN: To that end you’re implementing different kinds of scans, right? Can you tell me a bit more about the different kinds of exploration you can do? Will it eventually plug into landing on planets? DB: Yes. And I think the point is that there are different degrees to which a planet can be explored. You can see it from a distance and get a rough size and orbit. Then you can drop probes into the surface to get things like composition data. One of the things I’ve always been careful about is not calling the ship’s main scanner ‘radar’, because it’s not radar. Radar blasts out a signal and waits for a response, while the scanner in the game is passive, it’s entirely relying on emissions from things. But now we’re introducing active scanners, like radar, to scan planet surfaces. It’s a very bad idea to use radar in space however, because you’re beaming out signals and saying “hello! I’m over here!” You would be so unbelievably visible to other ships, and it’s so easy to make a missile follow along the line of a radar signal. That’s what we do today in the military. So radar will penetrate a planet’s atmosphere, but notify anybody else in the system of your whereabouts. The amount of power you need to scan means that just about anybody else in that stellar system will be able to pick you up. PCGN: But later in development, when there are billions of systems to explore, surely the likelihood of somebody else being in the same system as you will be vanishingly slim. DB: That’s not true. Firstly, there are 400 billion systems in the game now, we’re just not letting you visit them yet. But people will always start somewhere in a sphere roughly 100 light years across. There’ll be a big zone in which most people will tend to be. Even after you tool up and can go farther you’re still only covering a tiny volume of the galaxy, and naturally players will always be concentrated into that space. What I’m hoping for too is that people won’t want to play solo either, so you’ll have explorers encountering one another and striking deals, saying “you go left and I’ll go right”. Or it becomes a race between explorers to return to the home systems with new data first, because it’s the first person to register the data who gets paid, while the second person’s data becomes redundant. That said, we may consider paying something for second place, just so it’s more fun for people. A second map is still useful information as it verifies the first, so it might end up being like points for a Formula One race. PCGN: How much thought has been given to landing on planets? DB: We’ve had it working in the past, in the sense of rendering the planet surfaces and the collision detection and all that sort of thing. The problem is that once you actually land on planets they are vast, unedifying hillsides. I found this was the case in Frontier and First Encounters too. At least First Encounters was richer because we’d included snow and modelled mountains and valleys and rivers. But the real problem with it is that, other than the fact we plonked cities down, there wasn’t very much to see and it felt very samey. 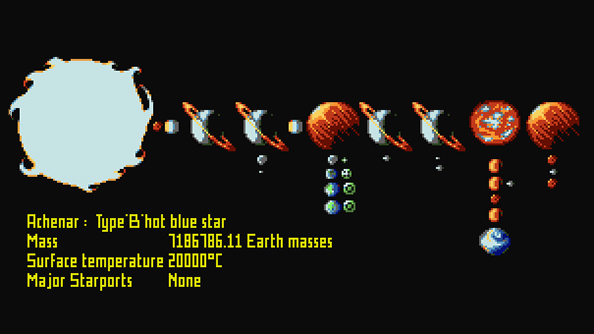 I don’t want that in Elite: Dangerous, I’d much rather we did it properly. So the idea is that we’ll gradually roll out the ability to land, initially on airless worlds, and make it worth doing. Currently it’s not worth doing. And I think doing it badly would be worse than not doing it all. EspEcially today when people’s expectations are so high. They’re going to expect the ability to drive around on the surface, to run around, to shoot one another. Each one of those is potentially a whole new game and I’d rather we’d actually spend time creating something good and enjoyable rather than trying to shoehorn it in. There are a lot of other things we said are coming that won’t be in the first release, like having multiple players in one ship. That would be wonderful. You look around the bridge in an Anaconda and it’s huge. It would be great to look around and see your friend sitting in one of those seats, being able to chat to them like we’re sitting here chatting now, only they’re on the other side of the world. I think that’s wonderful. But having a war on too many fronts doesn’t sound like a good idea. I don’t want to do lots of different things badly. I’d rather we do this part of the game well and then use it as a great basis to move on and do the next thing, to focus much more narrowly on one thing and then add to it. We have to make sure that what we do, we do well. PCGN: Thank you very much for your time.